Uryuu is only in episode 2 of the anime and his name is Lenny in the English version. Uryu was a resident in New Domino City, but after he and his friends (Lug and Larry) caused some trouble, they were sentenced to live in the Satellite Ghetto, earning them criminal marks. While at a plant in Satellite, he starts to fight with Tank, Blitz and Nervin. Later Uryu and his friends again bump into Blitz, Tank and Nervin but find them with Yusei and Rally. 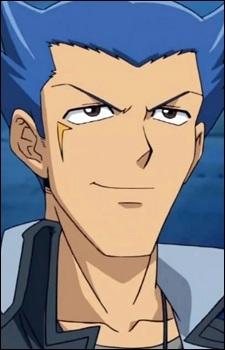 Uryu sees Yusei's Duel Runner and wants to use it to escape, so he says to hand it over. Yusei refuses and Uryu challenges him to a Duel with Yusei's Duel Runner on the line. Uryu uses a Power Insect Deck, which is based on swarming the field with power Insect-Type monsters and inflicting damage to his opponent.